NEW YORK, NY--(Marketwired - February 14, 2017) - On Cupid's busiest day, men and women scramble to find gifts that best express their feelings towards their significant others, loved ones, and friends. 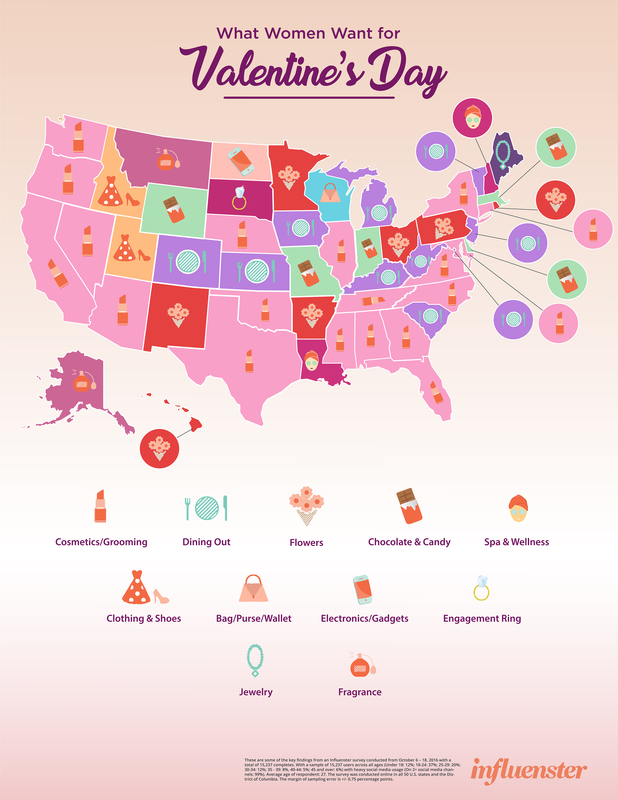 Influenster, the product discovery and reviews platform, surveyed 6,899 women to find out their thoughts on Valentine's Day, who they celebrate the holiday with, and the types of gifts they would like to receive. Of the women surveyed, 71% of them have significant others and 87% of them celebrate Valentine's Day. Of the 13% who choose not to celebrate Valentine's Day, their reasons vary from "it leaves out those who are not in a relationship" (31%) to "it limits celebrating romance to just one day" (30%), "it is commercialized" (29%), "places are too crowded to celebrate" (13%) and "it is too pricey to celebrate" (10%). For those who do celebrate Valentine's Day, 79% of them spend it with their significant other -- nothing surprising there. Although, it was interesting that 31% of them celebrate the holiday with their children, compared to parents (18%), girl friends (16%), both girl and guy friends (13%), siblings (12%), relatives (7%), and guy friends (4%). Save your DIY gifts for another holiday. 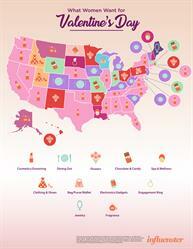 Women want to be pampered on Valentine's Day. When asked about the types of gifts they like to receive on Valentine's Day, 71% of the women surveyed revealed they would like to receive a pampering gift (70%) compared to a physical gift (63%), experiential gift (39%), or a DIY gift (33%). Only 2% of women revealed they do not like to receive gifts on Valentine's Day. Almost two-thirds of the women surveyed think that $21 - $100 is an appropriate range of money to spend on Valentine's Day. Here is the full price range breakdown: $0: 1.22%, $1-$10: 2%, $11-$20: 7%, $21-$50: 29%, $51-$100: 36%, $101-$200: 17%, $201-$300: 4%, $301-$400: 1%, $401-$500: 1%, $501-$1,000: 1%, Over $1,000: 1%. Cosmetics/grooming is American women's most wanted gift. When asked about what they specifically want for Valentine's Day, the women surveyed revealed cosmetics/grooming products were their top gift choices. Although not commonly associated with Valentine's Day, cosmetics/grooming products as the most wanted gifts reflect a cultural shift in what is acceptable as "romantic" gifts. More traditional gifts associated with the holiday such as dining out or flowers came in second and third respectively for overall number of votes received. These are some of the key findings from an Influenster survey conducted from Jan 13 - 23, 2017, with a total of 6,899 completes and a sample of 6,899 users across all ages (18-24: 47%; 25-34: 38%; 36-44: 11%, 45-54: 3%; 55+: 1%) with heavy social media usage (On 2+ social media channels: 99%). Average age of respondent: 26. The survey was conducted online in all 50 U.S. states and the District of Columbia. The margin of sampling error is +/- 1.38 percentage points. Influenster is a product discovery platform and reviews site that enables consumers to find new products and get advice to make informed purchases. Members use Influenster to explore the latest products, gain fresh insight, pick up new tips, and share their opinions with others. We help our members compare products and guide them on how products can be integrated into their lives. We inspire a love for products and encourage discovery, conversations and reviews. The Influenster community of 3 million+ members is still rapidly growing. These product mavens with a heavy social media presence use their influence to spread the word about the products they know. Ever since the launch of Influenster.com 3 years ago, over 13 million reviews have been created on more than 2 million products. Headquartered in New York City, Influenster was founded by Elizabeth Scherle and Aydin Acar in 2010. For more information or to become an Influenster visit: www.influenster.com. About this company Influenster, Inc.